Brrrrr.....it wouldn't be outdoor track and field in Wisconsin without a track meet in 30 degree weather. Hopefully we got it out of the way for the season and the weather will cooperate with us for the rest of the season. It was fun to see everyone have a chance to compete finally. Many athletes have been working hard over the last 6 weeks and it was nice to see it come to fruition with PRs at their first meet of the season. We look for big improvements out of all of our athletes, especially because the conditions were not ideal. Dual meets are used for workouts, try new events, and prepare for larger invitationals. The performance of the meet goes to Corinne F who set a NEW SCHOOL RECORD in the discus with a throw of 143' 8" beating the old school record by 12 feet!!!! 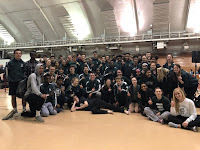 What a great start to the outdoor season :) We had event winners in McKenna G in the 100 dash, 4 x 100 relay, Anna H in the high jump, and Corinne F in discus on the girls side and Daurice F in the 110 Hurdles, Rob S in the Shot Put, Daurice F in the 300 hurdles, Rob S in the Discus, and Blake T-J in pole vault. LaFollette won the girls dual 98 - 39 and the boys dual 90 - 53 but we closed the gap on many of their competitors in just the week - two weeks time that we have seen and competed against them. This time of year is getting busy...we need to take care of grades, make up school work for miss time at meets, take care of your body (GET SLEEP), and lets be ready to go out and compete every meet, every practice, every day. Dual Results --> Meet is hand scored...so hard to get all results on the internet BUT we will have Memorial individual results posted at school.